This is the final result of Red Rose Daddy's Movember effort. Quite an impressive moustache there, don't you agree? 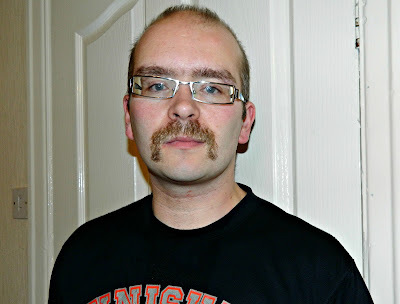 I'm quite relieved that it has gone now, especially since he opted for the full on Hell's Angels Handlebar 'tache. Not a bad effort from the clean-shaven face of Welcome to Movember. The men at his company have raised a good sum of money for men's health charities and we're very proud of him for his efforts.